I love the ombre effect on the first card! I love both of your cards here. The colors are just so sweet. The stamps are so adorable, love them so. Sooooooooo Cute!!!! Love these Fabulous Cards Lucy...just Perfect!!! GREAT use of that Neapolitan paper...I love both cards, Lucy! Happy belated 1st birthday to little Lily! AND congrats on making the Studio Calico team! Yay! your cards look good enough to eat! Cute cards! Love seeing the new HA stamps. Love the sewing/layering. So cute! Love the colors on the cards. Such adorable, colorful, happy cards! Wow! I just never would have thought of that- so fun! Such great colors! Love how you layered that second card! beautiful cards...the ice cream cone is so sweet...but I really love the thank you card! Love the cards, Lucy - and that birthday set is definitely on my list! my fav is your thank you card - the colors are so cheery! Both the cards are beautiful.Love the googly eyes and the colors are so fresh.. Love it! Love the first card. So much fun! Beautiful cars! I especially like the first one - so fun! Both cards are so bright and cheery! Great fun! Your cards are so cute. Love the colors and loving the new HA stamps. Love your cards, Lucy. The Fantastic Birthday set had already caught my eye this morning. It's definitely one of my favourites of the new stamps. Have a wonderful weekend! I love, love, love your work. Both are great but the way you added a face to the ice cream cone is so cute! Lovely bright and cheerful cards Lucy. I love the ombre effect on the first card! The Ice cream cone is Perfect!! I love your Thank You card, fun use of the stamp and colors!! I love the color of your cards. They are just so bright and cheerful. The perfect way to display those stamped images and sentiments. Loving these fun and cute cards! Cute! Love the sewing on paper, it gives such a nice finish. What adorable cards! The eyes are such a fun touch. That paper-pieced ice cream is just too cute. Thanks for sharing! Love the color combo and that ice cream cone is too cute. Love the colors you used and those giggle eyes haha so funny. the ice cream cone card is so so cute. The colors you used are just right and very appealing. Super fun and cute cards! Such sweet and pretty cards!! Sweet cards. I think that washi tape message set will be one of the first on my wish list. So adorable! Love the color combo on first one. Sweet :) Love the thank you done 3 times over, great idea! Love the pastel colors with the craft. Thanks for sharing. Love the ice cream cone - my fave! Cute, love the colors. Thanks for sharing! The cards are terrific and I really like how you stitched everything down. Awesome giveaways!! Great cards! God bless! Lucy, both of your cards are adorable but that wiggly eyed ice cream makes me smile big - fabulous! these are clever! love the stitching also! Such fun cards, Lucy! Love the happy colors! Great use of color and the ice cream cone looks good enough to eat. great color combinations! These are super cards. thanks for sharing. These sweet new Hero Arts stamps suit your style to a "T" Lucy! Well done! I love the colors you used Lucy and I especially love your first card and how you dressed up that sweet little cone! Such sweet cards, Lucy. The ice cream card is sooo yummy. Adorable cards! I am in love with the first one, great stitching, and those googley eyes! Love! Cute cards!! Love the sweet colors!! I love the sweet cards you made today. Love the colours. Cute color combo and love the stitching!! Fun cards! Puts me in mind of hot sunny days at the beach with ice cream dripping down my hand! Love the fantastic sowing. And the eyes on icecream are adorable! Such a "springy" card. Love the ombre effect and that ice cream cone is great. super cute - love the ice cream cone with the face!! SO sweet Designs!Love the new stamps. These are such sweet cards!! Pure sweetness! Love the cards! Love the colors and designs! Really sweet cards! Lucy, love your cards, the washi saying stamps are awesome. I love the Neapolitan paper with your ice cream cone. Clever. Beautiful cards! Wonderful cards. Love the googly eyes. Really love the colours on these cards! Love the colors you used on these cards. the washi tape on the stamp is SO cute! Adorable cards, they look absolutely yummy! Fun, fun cards. Yummy colors. Love he wiggle eyes on the ice cream cone! Thanks. Both cards show fun and humor. Love your stitching, I really, really need to try sewing on paper. Looks awesome. oh my gosh the ice cream cone is adorable!!! Lovely yummy cards. Such beautiful colours to go with the stamps. Want to eat the first one! Well done! Your cards are both so perfect with the sewing, color paper. Love the eyes on the ice cream cone. Too cute. Thanks for sharing and hope you have a fantastic Holiday season. Great cards in lovely colours! Just fab! lovely ice cream colors- and googley eyes! Lovely cards Lucy - sweet colours. The icecream cone card is so cute. I guess I would need that stamp. Cute cards! 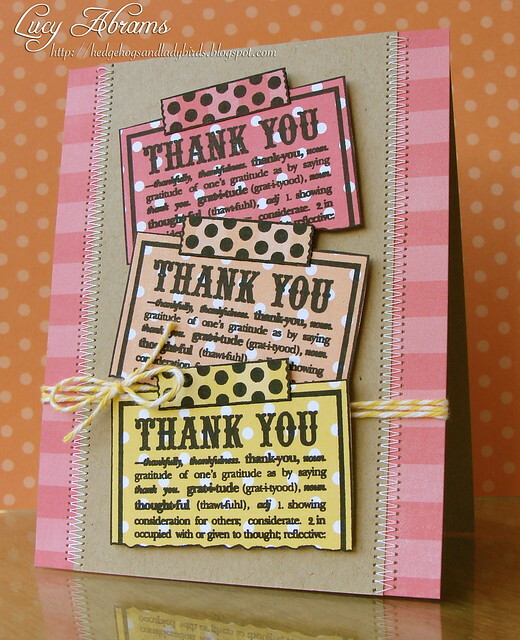 I especially love the colors and patterns on the thank you card! I love how you put googly eyes on the ice cream...so cute. Cute colours on these! Beautiful job! Very cute cards. I like the googly eyes on the ice cream cone. Love both cards. Such great inspiration! Lovely cards! I love the new stamps. Very trendy and lovely. Love the new stamps. so loving these new stamps! How cute are those googly eyes! The ice cream is super cute! Love the ice cream cones and the googly eyes are a perfect addition. Both of your cards are just adorable. Really love the ice cream cone! That neopolitan paper is yummy. Pink and yellow are not the two colors I'll put together often, but you made a great card! That birthday card is too cute! I love your choice of papers. Beautiful cards! Loving these new stamps! I just got a sewing machine, can't wait to add that special touch that I admire in your cards! very sweet , cute card. Very cute card! Love the new stamps. Love your paper choice - it goes so well with these stamps! Love your cards, they are too sweet! You are so creative and talented! Thanks for the chance to win! Wow! Fun images, great designs and fun color combinations. Perfect! Your cards are always so BEAUTIFUL! I love your color palette choices and your stitching just takes it to the next level! Thank you for sharing your inspiration with us! I love the color combos on your cards! What wonderful cards! I love the google eyes! lovin' how you used the neapolitan dp w the ice cream stamp; it's delish! thanx for the inspiration! Both cards are so much fun! Love these new sets! I loved your colors and the "eyes" Great cards Thanks! Refreshing to see some different colors besides the Holiday colors. Great job! Lovely cards! Your first card is so cute... love the ice cream cone with the googlie eyes and great sentiment too! I like the ice cream-y colorsd you chose to use on the first car, and I love the idea of a stamp that looks like washi tape. Thanks for the chance to win! These cards are so much fun! I love the way you repeated the sentiment to create a design. Lucy, thanks for sharing both your ideas. I love the whimsey of your ice cream cone face. The way you pieced the 2nd card is wonderful. How cuteee!! i love the ice cream with googly eyes card! Sweet cards! Love the colors. Luv, luv, luv your cards and the stamps that you used. The face on the ice cream cone is sooo cute. Loved both these cheery cards. I love both of your cards, and the colors and the stitching and the googly eyes on the ice cream cone. How cute is that? Love the colors and the stitching! I love your cards--especially the colors. They just make me happy! Wonderful cards! I am in awe of your stitching skills, your lines are always so perfect. Love both cards! The colors are great! The ice cream card is so cute. These are fabulous, as are the new stamps! Love your cards, especially the ice cream cone with the googly eyes. Both of these are so cute! Love the colors and stitching. Loving both new stamp sets and your cards! Cute cards - love the stamps and the colors! Wonderful cards. Loving the google eyes. YUMMY cards. Love them both. Super sweet card, love the colours and the sewing. Washi tape STAMPS?!? What will HA think of next?!? so cute.. love the thank you card! I love the ice cream card with those colors! And congratulations on your earlier news. Well deserved, clearly. Love the ice cream cone! fun cards! love the googly eyes! How did you know I just purchases the Lovely Birthday stamp set? love it and your tasty card. You sewed on the card. Amazing how straight the lines. Okay, I don't sew. threading the needle impresses me. I love both cards and never think of repeating a stamped image unless it is a flower. Cute cards--love the eyes on the ice cream cone. 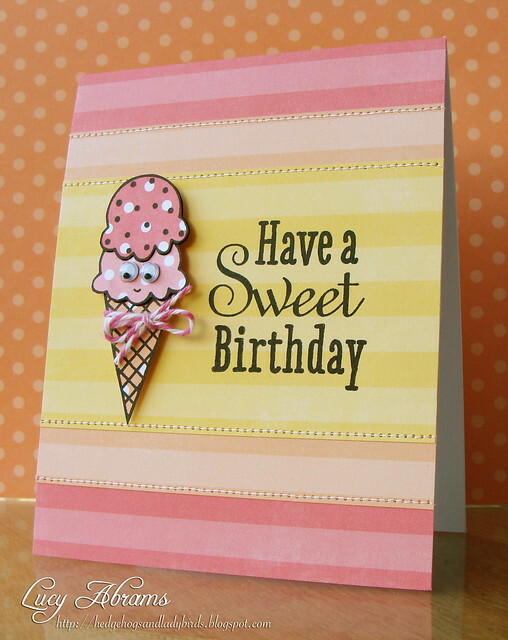 Lucy your cards are so cute, love the ice cream cone and sweet sentiment. Love the googley eyes on that ice cream cone! I did this on a cupcake once; maybe they could be a couple!! Love the neapolitan papers!! Your ice cream cone is adorable. Love the colors.